NSF, was yesterday described by the Southern Senators Forum, SSF, as a product of confusion and ignorance of the issues at stake. It also described the argument of the Northern Senators that since the President was not part of the Confab, he would not implement it, as laughable. The Chairman, NSF, Senator Abdullahi Adamu, who spoke for the forum at a retreat of Northern senators in Katsina, had said it was unfair for Southern senators to ask the President to implement a report to which he was not part of. 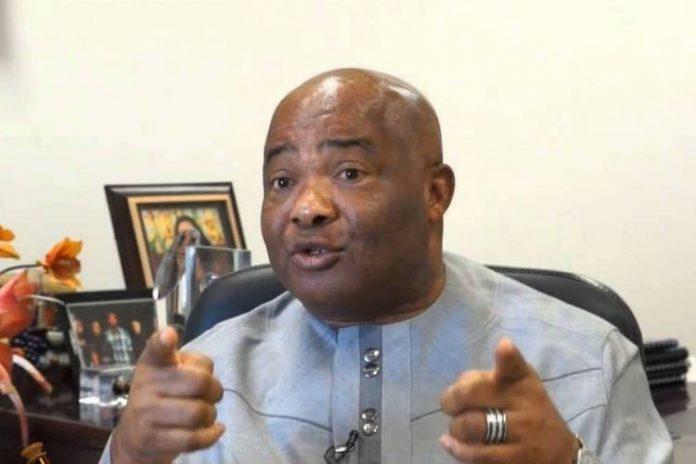 However, a statement by the Chairman of SSF, Sen Hope Uzodinma, said if his Northern colleagues had studied the communiqué earlier issued on the matter by the SSF, they would have realized that it was drawn from the papers submitted by eminent Nigerians from all over the country. The statement reads: ‘’Adamu’s (Chairman of Northern Senators Forum) action and utterance smack of a town Union President who out of zealotry to protect his union and who erroneously sees the President of the country as a member of his union embarks on an indecent haste to speak for the President all in the name of protecting his Town Union. “The communiqué by Southern Senators Forum merely asked President Buhari to convene a meeting of governors and the leadership of the National and state assemblies to consider the report and forward to the National Assembly for debate. I wonder why Adamu should be in a hurry to defend a President who has not complained about the communiqué. Has Adamu forgotten that the President’s party and his party too, the APC, promised to restructure in their manifesto? Even Adamu admitted that the 2014 conference report treated restructuring extensively. What is wrong in asking the President whose party promised restructuring to consider sending a restructuring report to the National Assembly? “Let me inform my colleague that Southern Senators met in Calabar on a well-planned retreat on how to deepen national unity through devolution of powers. It appears that in Adamu’s indecent haste to attack our retreat he ended up holding one that had only sectional interest, and not national interest as a theme, including how to extend the oversight functions of senators to the implementation of the 2018 budget in the Northern states.